Tuesday – July 29th, 2014. An inspirational movie: “Moving From Emptiness: The Life And Art Of A Zen Dude.” This movie screens one night only in Austin. Playful. Profound. Meditative. Deeply healing. 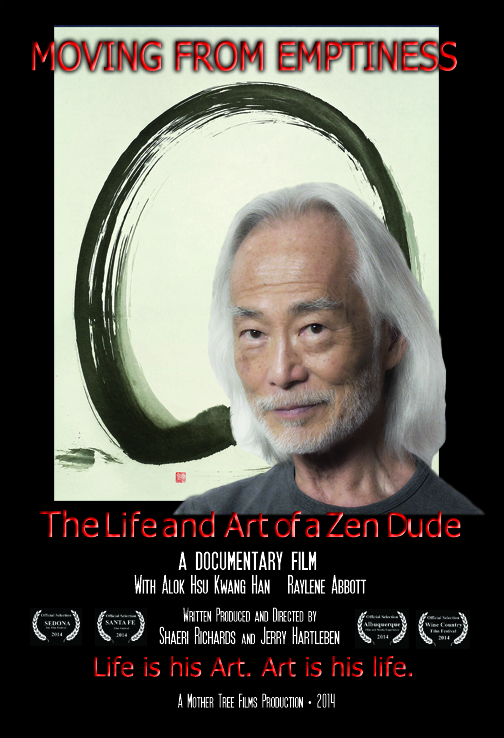 “Moving from Emptiness: The Life and Art of a Zen Dude” is more than just a film, it’s a transformational experience. Rated one of the top documentaries at the Sedona International Film festival, this 69-minute film features the work and teachings of Zen calligraphic painter Alok Hsu Kwang-han. Armed with rice paper, ink, brush, and a collection of Zen teachings and koans, Alok opens the door to a world of magical brush strokes and enchanted students. On the verge of his 75th birthday and with a new love in his life Alok employs his teachings to confront his own personal history. Tickets are available online only at the link below. There will be Q/A with the Filmmakers, Shaeri Richards and Jerry Hartleben, directly after the screening at the theater.